The two projects on this week's short list take a new look at traditional (edible) garden forms, creating links with landscape architecture history. We begin at the orangerie, a classic element of landscape design. Originating in Renaissance gardens, the orangerie came to be a status symbol, reflecting the wealth of the owner. Essentially a large and ornate greenhouse, the term orangerie refers to citrus trees moved outside during the summer, and inside during the winter months. In this way the orangeries is also a power symbol, communicating a mastery over nature. 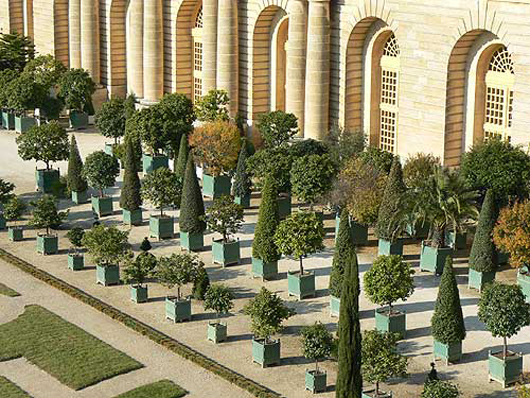 The largest and most famous orangerie housed Louis XIV's collection of orange trees at Versailles. When I read about Berlin's Prinzessinnengarten, an urban park/farm/education center with mobile beds that are moved inside for the winter, the orangerie metaphor seemed apt. While the garden's creators reference the idea of the nomad to explain the mobile phenomenon, the classic form of the organerie rings truer. Nomads tend to be hunter/gatherers, or in the modern definition of urban nomads, simply people free of fixed geographical identities. The labor of moving garden beds twice a year, on the other hand, is a labor rooted in defying the limitations of one's fixed place, and of committing to making the best of it where one is. Another classic element of landscape gardens is the kitchen garden, an area of the garden dedicated to growing herbs and vegetables for the kitchen. When a garden magazine extols you to 'grow your own', essentially they are promoting the renaissance of kitchen gardens. Such gardens can be found in the earliest records of gardening, and provided food and medicine to Indian rajahs, medieval monks and British homemakers, (to name a few), in turn. At last year's Chaumont-sur-Loire Garden Festival, a garden dedicated to tea neatly wrapped up many threads in the history of kitchen gardens, and surreally presented it with undertones of Alice In Wonderland. 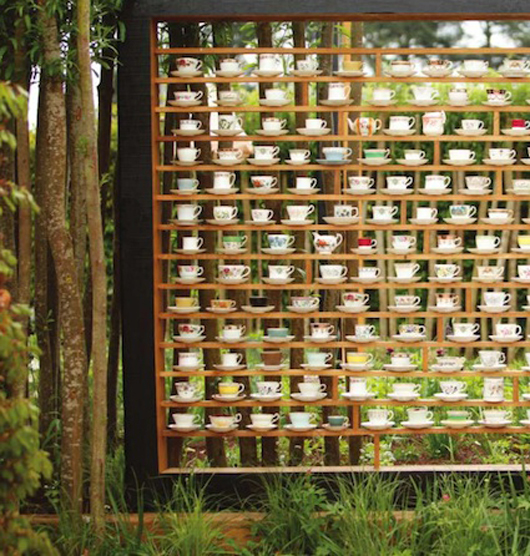 A tea party on a wall, the garden promoted awareness of native plants used for herbal teas. While no real food appeared to be grown in the making of this garden, the paradoxical aesthetic of repetition and whimsy creates a wonderfully intriguing balance. On public lands throughout Paris, pocket-sized community vineyards are tended by neighborhood groups. The most well-known is the Montmarte vineyard, which claims an entire sloping block in the heart of the neighborhood, and makes enough wine (1,500 half litre bottles) for an annual harvest festival. Reportedly there are 150 such vineyards in Paris and its suburbs. The three vineyards highlighted below are part of public parks, each built fairly recently. Parc de Bercy in the 14th arrondismont, opened in 1994, was designed by the landscape architect Phillipe Raguin. On the site of a historic wine storage area, the new park retains many traces of the past: in the historic buildings which dot the landscape, and the rail tracks for the train that served the winemakers of the area. The park also features a small vineyard, managed by a neighborhood group. The larger park is a sequence of gardens, from wooded glades, to reflecting pools and rose gardens at the residential end of the park, to grand plazas and water walls at the stadium end of the park. Parc de Belleville integrates a small vineyard of chardonnay and pinot grapes amongst strolling paths, arbors, an adventure playground and a sloping lawn that offers views over the city. The vineyard serves primarily as a nod to the agricultural past of the Belleville district, although the actual site of the park was a gypsum quarry. Parc Georges-Brassen, located on the site of a former slaughter house, features a 1200 square meter vineyard of pinot noir grapes. The grapes are harvested by the community and the wine is sold in a neighborhood bistro. The park also features another farm program - bee-keeping. An annual sale of the honey takes place in the park near the beehouses. Other programs include a large playground with climbing wall and a rose garden. ﻿These vineyards are fascinating precedent for ag programs in public parks. Each is compact, and occupies a distinct zone within the park. Each involves the community at some level in the harvest and sale of the final product. The vineyards also reflect the culture and history of the area. How would this look stateside? Orange groves in Fort Lauderdale or Los Angeles, dairy cows roaming the hills of suburban Boston parks, cherry orchards for an Ann Arbor park? Imagining such programs requires us to mine our agricultural history, and to address issues of identity, ownership, ecology and climate in a way public parks rarely do. Similar in concept to a business park where one landowner manages the overall landscape and infrastructure, and multiple businesses rent out only the amount of office space they need, an ag park is a powerful tool for creating agricultural opportunities in cities and suburbs. 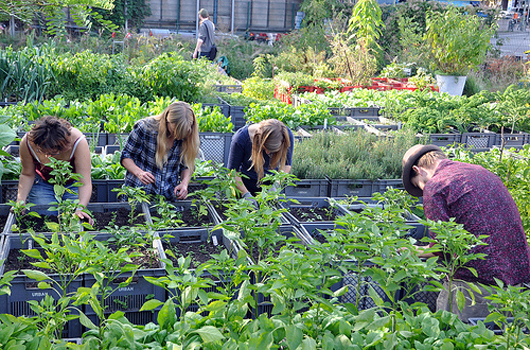 It addresses head on the major obstacles for new farmers in urbanized areas: high cost of land, and lack of experience. By providing small plots that farmers can eventually scale up, the ag park alleviates the need for major capital investment in land and the pressure to manage a full scale farm from the start. Similarly, ag parks have the requisite infrastructure in place - irrigation, deer fencing, tool and packing sheds - that give new farmers a head start without needing to raise significant start up funds. Finally the ag park brings together farmers of different experience levels, facilitating transfer of knowledge from one generation to the next. In addition, ag parks typically incorporate a ecological restoration or preservation program, and create open space opportunities in the form of multi-use trails and other public uses. "to grow viable farms, preserve productive agricultural land, increase access to local, organic food, compost and other soil amendments, and protect water quality through organic waste management and stream bank restoration"
The Sunol Ag Park in Sunol, CA is a smaller enterprise, hosting five farms on 18 acres, thirty minutes east of the Bay Area. A clear sign of success is one farmer who increased his plot from 1/2 to 9 acres in just four years. One of the notable aspects of the Sunol Ag Park is its location on a public utility easement. Identifying such underused land in urbanized areas, and partnering with the owners to bring productive programs to the land, is a key aspect of a holistic ag planning strategy. The non-profit that created and manages Sunol Ag Park, SAGE, has published a comprehensive guide, the Urban Edge Agricultural Parks Toolkit, to aid municipalities interested in creating similar programs. As more Ag Parks are created, the opportunities they present for urban and suburban agriculture may become even broader. One can imagine a full spectrum of ag-tourism, education and summer camp activities folded into Ag Parks that could help provide start-up funds for farmers, or expansion of the parks themselves. Designers might find the opportunity to experiment with edible landscapes in these ag parks, addressing questions of maintenance and management typical of commercial projects. The Ag Park model holds a lot of promise for incubation of ag-related projects, from the expected to the extraordinary. The perspective taken in this article in the Muskegon Chronicle about a local, urban CSA is refreshing. Rather than focusing on a gourmand approach to great tasting veggies, or the trend behind the rise in urban farms, it focuses on a CSA as an investment. Now in some ways this is an obvious point. But in a world of increasing financial turmoil, its a point worth spending some time on. For people with the financial means to have investments, the conventional choices - savings accounts, IRAs, mutual funds, etc - all mean giving control of more capital to financial institutions and large corporations. We have seen the dangers of this approach all too clearly in recent years - reckless lending, corporate monopolies and a financial system that seems to benefit very few. Often to a wage-earner if may seem as if there are few other choices for how to invest one's money. Thinking of a CSA as an investment in the future of sustainable food and the local environment is one way to understand the value of paying up front for your vegetables. Much more eloquent than I on this topic is Woody Tasch in his book Slow Money, which delves into the dangers of seeking high rates of return and the opportunities for investing in ways that support slow food. Although fairly technical it is still highly worth the read! A session on Alternative Captial at the 2011 Eco Farm conference explored a variety of ways that small farms and related businesses might be financed. Examples included the CSA members of Angelic Organics who invested in physical expansion of the farm, the Foodshed Initiative and subsequent La Montanita Fund organized by La Montanita Co-op in Santa Fe, the Permaculture Credit Union and creation of one's own "money" such as Salt Spring Dollars and Berkshire Farms Notes. Many of these efforts seek to find financing from individuals rather than banks for a host of reasons - not wanting to use one's farm as collateral on a debt, avoiding high interest rates or simply not qualifying for a traditional loan. The old saying "put your money where your mouth is" could not be truer in this context. What we buy matters, especially when you consider that every purchase finances potential business expansion. 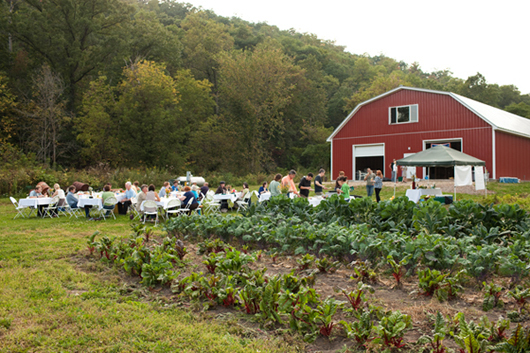 For landscape architects and planners, describing a farm program as an investment in the local environment can be an effective approach with some clients, who may value a productive landscape as an investment return. Further, knowing the full spectrum of financing strategies will help designers become more active and able advocates for small farm programs. Have you ever driven through a rural area,and wondered why some land is planted in vineyards, some in orchards, other in vegetables or hay, while still other has livestock grazing on it? There are many reasons why one farmer might grow, say, lettuce, while her neighbor grows, say almonds. Many times it boils down to tradition, as for most farmers agriculture is still a multi-generational business. They grow what their parents grew, especially if their parents planted an orchard or invested in specific processing equipment for a certain crop.Climate and microclimates also play a huge role in what farmers grow. And of course, the availability of irrigation water plays a huge role. If a piece of farmland is located along an irrigation canal, or has a groundwater well with a pump, much more can be grown on it than the same piece of land without water. All that said, the single most important factor in what crops are grown on a piece of land is the soil type. There are hundreds of types of soil in California alone, each and every one classified by a universal system and mapped by the Soil Conservation Service of the USDA (now the NRCS). You can look at a map of all the soils in your county (or any other county), and a detailed description and evaluation of each of them, online. Not all soils are good for farming. There are soils that are nearly perfect for farming just about anything, soils that are more limited, and those that won't grow much at all. "Good soils" are a balance of different particles (sand, silt, and clay) as well as organic matter. Too much of any one of those will limit what can be grown in it. Too many rocks and gravel in soil also limit its usefulness for agriculture. Another important element is the depth of the soil and what lies under it. The better the soil is for farming, the more food it produces using the least fertilizer, water, fuel and pesticides. This is why most environmental groups recognize preservation of good farmland as a key tenet of ecological sustainability. Something else many Californians don't know: our state's irrigation system was designed from the start to bring water to the areas with the best soils for farming. Since reservoirs tend to be in the mountains and good farmland in valleys, this was a natural fit -- especially since very little energy is needed to make water run downhill. It's true that throughout history, civilizations have survived in areas without much good soil by developing crops suited to their landscapes. Olives and grapes thrived in the rocky Mediterrean hillsides of ancient Italy and Greece, for example. But to sustain their populations, both civilizations ended up conquering other nations with better farmland. Rice is the only major staple crop that has been bred to grow on land that is otherwise useless for farming -- poorly drained soils that flood annually. California's valuable agricultural soils are not protected by any state or federal laws the way some of its unique natural habitats are. Local zoning laws in agricultural areas often give lip service to preserving the best land, but even a quick look at the NRCS soil maps reveals the truth: most new development in California in the past twenty years has been built on good farmland. The only state law aimed at protecting farmland is a tax credit called the Williamson Act that rewards landowners for keeping their land in agriculture. Unfortunately, the Act has repeatedly been a target of budget cutters in the assembly and governors office, dismissed as a tax break for wealthy landowners. Eventually, tax credits alone will not be enough to stop the destruction of critical farmland. Human populations will keep growing and good soil will be paved over until rising food prices force a shift in the economic and political reality that currently undervalues farmland. All Rights Reserved 2010-11. Simple theme. Powered by Blogger.